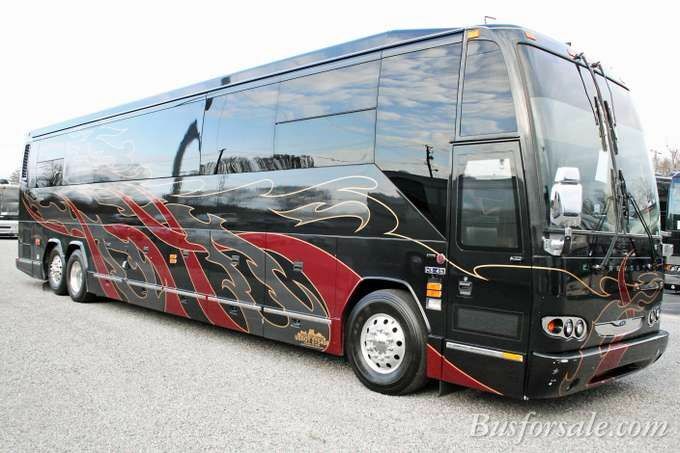 A beautiful 2007 converted Prevost bus, this conversion is like a luxury house that just happens to be portable. 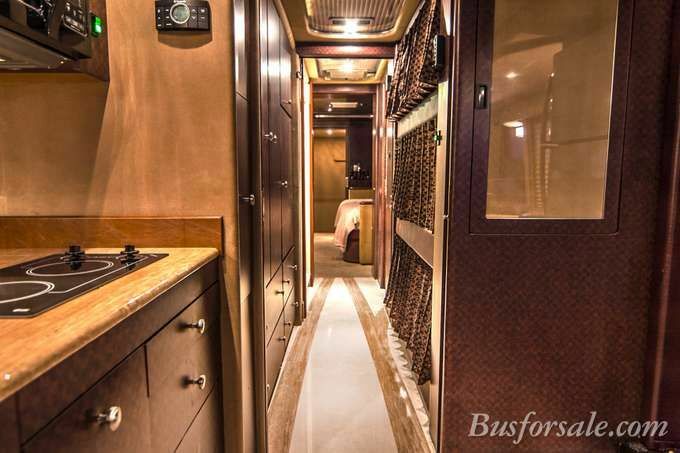 Take this gorgeous coach on the road and see why people prefer the road to hotels any day. 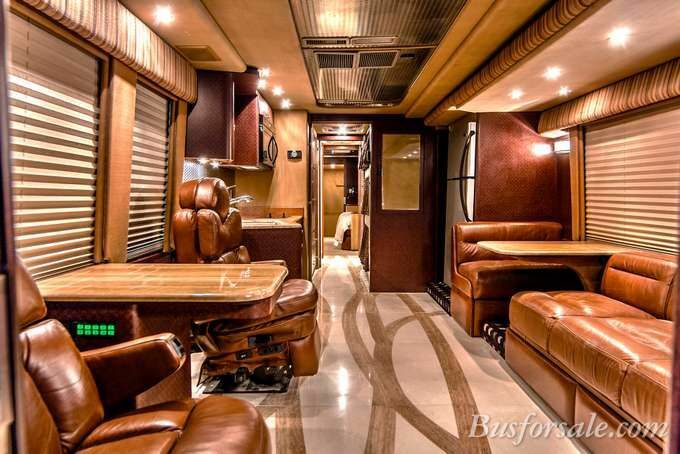 With a length of 45 feet, there's plenty of room to move around in this five-star bus. There is room for five guests to sleep, with spaces for up to seven guests to freely move about. A raised roof makes it comfortable even if you're tall (a plus, since many bus conversions cap out at around six feet!) 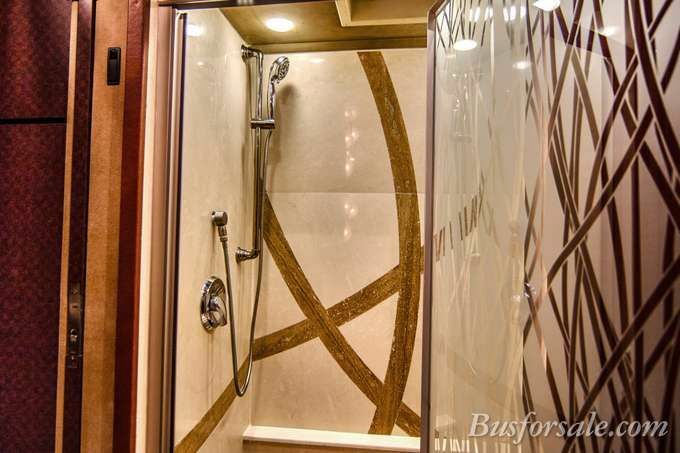 and enviable features such as a walk-in closet, granite counters, AC, and heat make this bus a must-see! 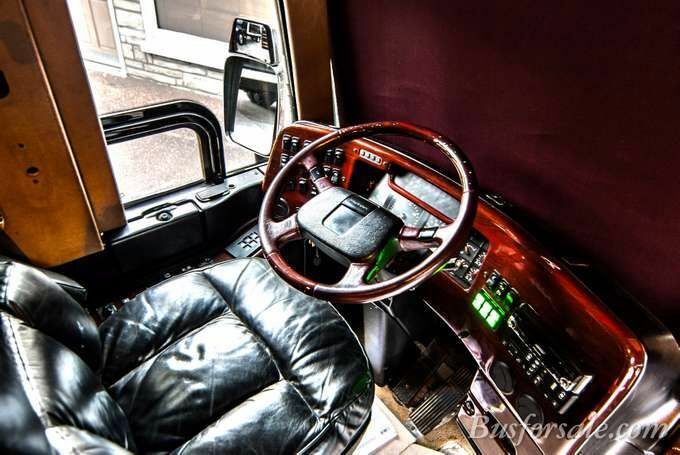 Head up the stairs to the cabin to get a glimpse of the overstuffed, comfortable driver's seat. The living/sitting/kitchen area is populated by supple leather seating that looks simply inviting and comfortable. 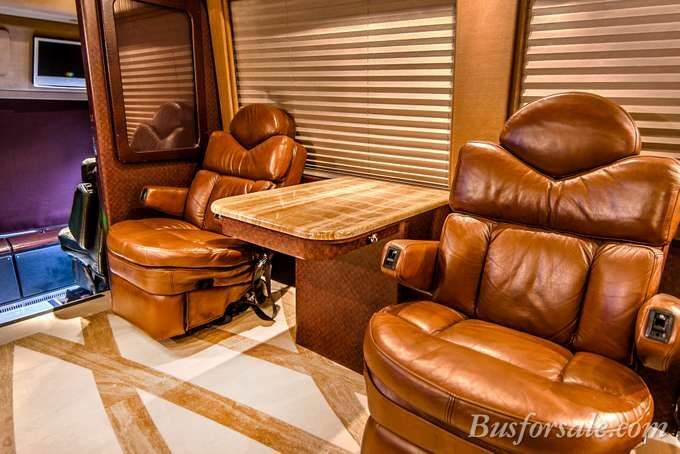 There are tables on either side of the bus, as well as a sofa, small dinette, and two reclining captain's chairs! Check out the gleaming marble floors! You can probably see your reflection in them! A flat screen TV, stereo, and DVD player provides endless entertainment while you lounge! Comfortable leather chairs are the perfect place to sit and eat or watch TV. The galley kitchen offers all the comforts of home, including a large stainless steel sink, granite counters, a refrigerator, microwave, electric stove, and plenty of hot water. 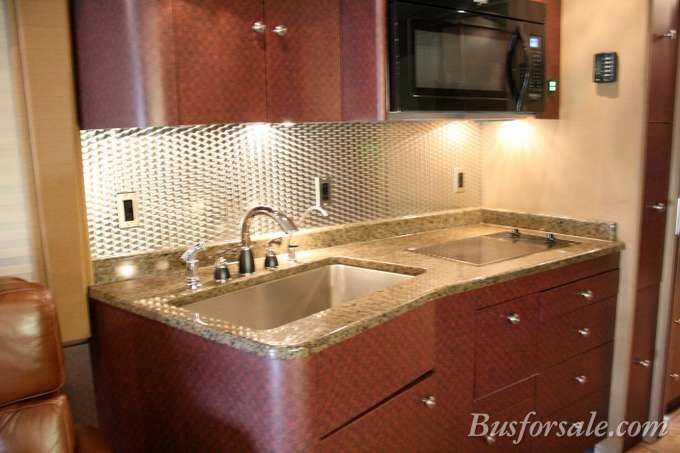 Cabinets and drawers provide storage space for cookware and food. As you can see, the hallway not only offers a sleeping bunk and closet space, but there's a washer and dryer tucked in there, too. 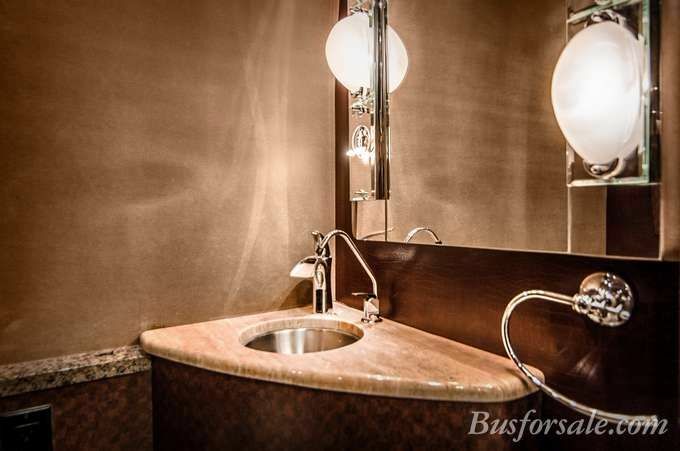 The bathroom features a beautiful marble shower and tub, along with a toilet and vanity. A small sink and oversized mirror complete the space. 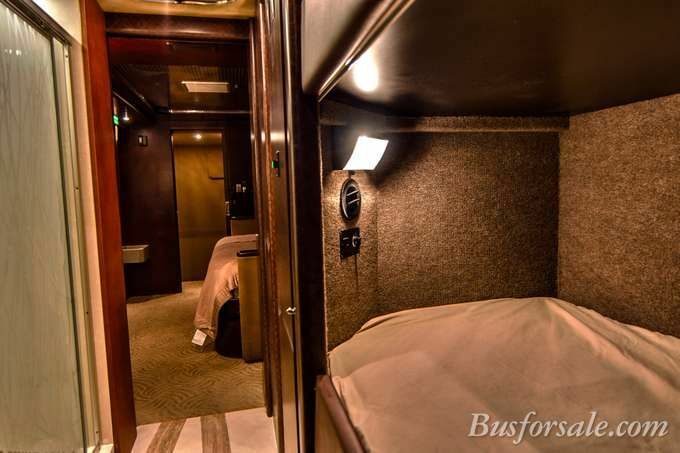 Sleeping coaches provide small bunk-style beds that accommodate one person comfortably. 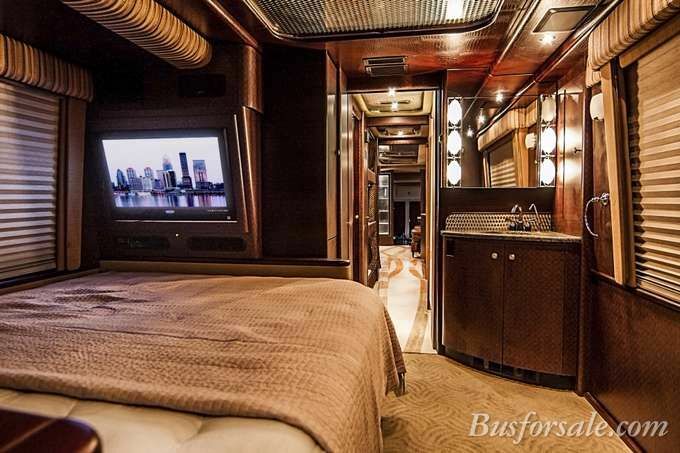 The back of the bus houses the master bedroom, which has its own walk-in closet, vanity and sink, and king-sized bed. The room has a flat screen television for the ultimate in luxury! You may never want to get off this bus and explore the outside world!